Oct 23 - Holiday Time! 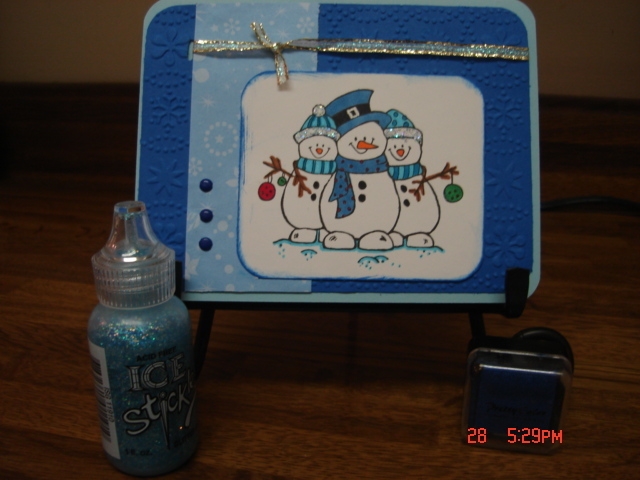 It seems that many of us are trying to get a jumpstart on making holiday cards. So I thought this week, we would try to get a couple things accomplished! Let's use some of our Holiday-themed stash, and make a Holiday card, or LO! 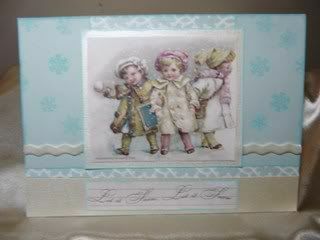 I've used some older papers, ribbons, embellishments, rub-on's, and even the brads I've had for awhile. It feels good getting a headstart on the Holiday Madness! Enjoy your day! and thanks for participating! Re: Oct 23 - Holiday Time! Sounds like a great idea.......I am so overloaded in Holiday (halloween and fall festivals) that I can't get any scrapping done until maybe Sunday! OH i have 2/3 christmas cards made only! LOL! I guess you'll catch up Rose - I'm away next week ... how many do you think you'll have when I get back? Ok, as promised, I'm including my takes on the challenge in the next few posts...the next few, because I'm technologically challenged, and don't know how to put all the links together, lol. But I'm ok with that! 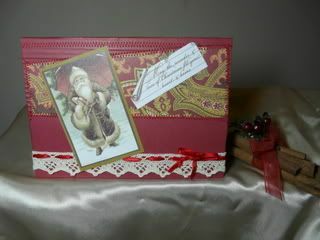 great cards Robin - I'm using my stash too ... just not Holiday stash today! That's ok Beverly, we still want to see what you're making! & some bits I can't share cuz they are DT stuff - I have scheduled blog posts to keep it going while I'm away - I'll have no internet access either. Jennifer, LOVE your card! Thanks for taking the challenge! Are the snowmen a stamp that you colored? Love the stickles, they are GREAT on holiday pages/cards, aren't they? Love the colors too! GREAT JOB!! I have not idea where the stamp is from! It was in a card kit swap I did....But i do know it is a stamp. I too loves stickles....OK any kind of glitter! Here is another I did tonight! Oh that one's really cute too! Look at you cranking the cards out! I need to get off here, lol, and get in that scrap room of mine! Iknow it is hard to pull myself away from this sight. I may be a bit biased but I think it is awesome....not just because of me! WOOHOO you go Jennifer! I have two finished....but can't show them yet......DT stuff......but soon! Rose is that Crafty Secrets? It so looks like them! yes,adoreeeeee there stuff big time!